Strawberries, Figs and Pears . . . Oh My! Now that I’ve taken more than a month off from blogging, I better get back to posting wouldn’t you say? My latest adventure in the kitchen is short and very sweet! My local store is featuring fresh organic figs and while I don’t eat figs very often, I was drawn to these with dessert in mind. I thought of pairing them with pears (forgive the clumsy quip) from my backyard tree. 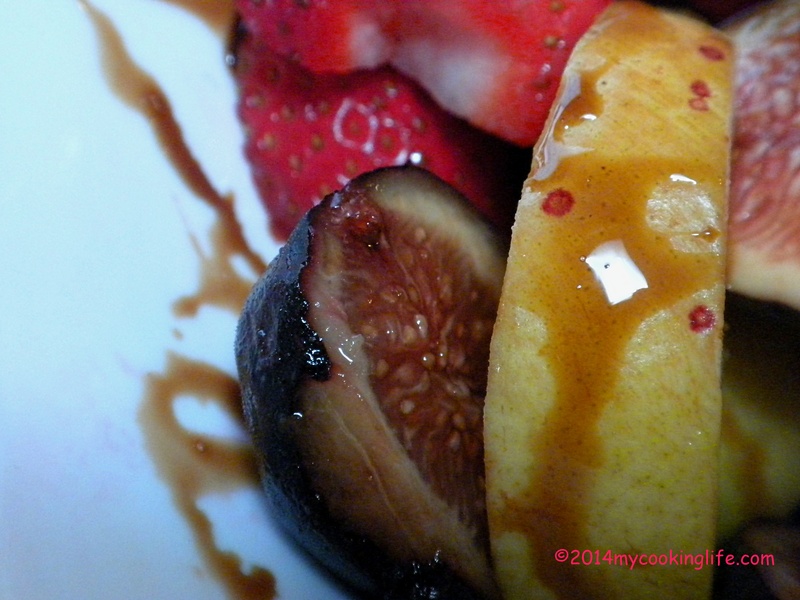 My pears were ripe and tender which was perfect with the figs. I have some wonderful “Cafe Espresso” Balsamic Vinegar in my refrigerator. Throw in a few bright strawberries and add a touch of mint and there you have a late summer dessert that will satisfy any sweet tooth. Figs are pretty amazing looking, aren’t they? Wash the fruit thoroughly. Core the pears and slice anyway you want. Halve the figs and the strawberries. In this combination, you want to adjust the fruits so they are pleasant and easy to eat together. If your pears are very crisp, you can blanch them for just a few seconds in salted boiling water. This has to be really really fast because you don’t want mushy fruit compote. You just want to take the edge off the crisp pears so they can be easily eaten in this dessert without losing the contrast between the softer fruit and the crisp pear. In a small saucepan, bring your dark balsamic vinegar, barley malt and sea salt to a simmer and reduce the sauce to the desired thickness. Watch that you don’t over-boil the barley malt. If it gets very hot and boiled it will turn into a soft and then a hard candy texture. Just simmer. Assemble the fruit in bowls and put the sauce on them just before serving. Garnish with mint leaves. Taming this fruit and sauce for photos was certainly a challenge! 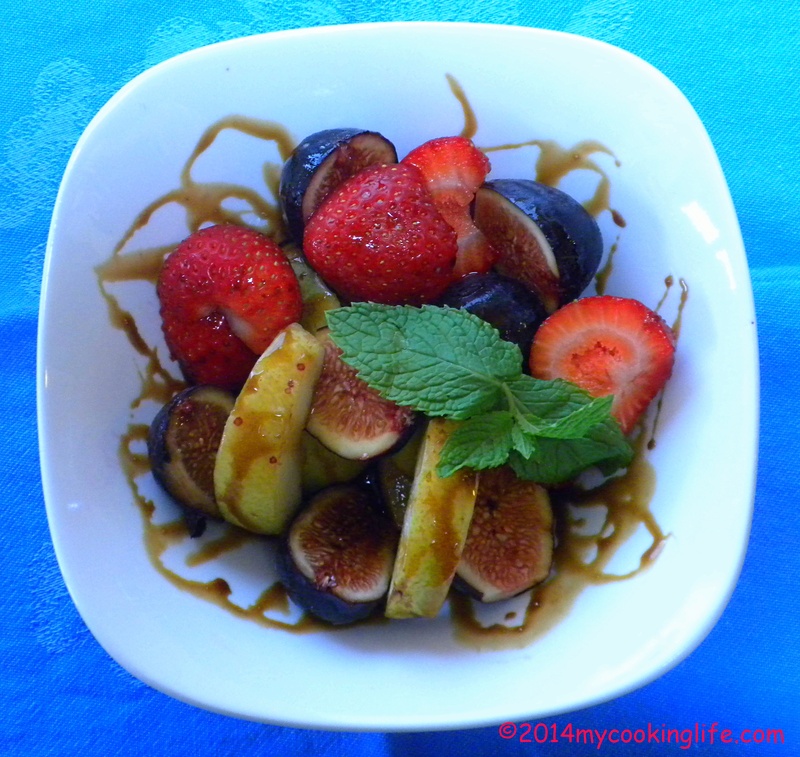 This entry was posted in Desserts, Fruit and tagged balsamic reduction sauce, espresso balsamic vinegar, fresh figs, sugar-free dessert, using barley malt as sweetener by mycookinglifebypatty. Bookmark the permalink. This looks so good, Patty. Mmmm…. We rarely can buy fresh figs here. My daughter’s boyfriend introduced me to them, so I keep my eyes peeled for them. This looks like a great recipe to try. And it is so simple! Hope you have a chance at fresh figs at least once before they’re gone Kathy. Love figs and I wish they did not have such a short season. This looks like a delicious fruit salad. Yes, it is very short and the fresh ones are so different from dried ones. I understand! You can always switch things out. I do it all the time. If it’s the idea of vinegar that you’re not sure of, the kind I use is aged 18 years and is incredible and sweet. I’ve put it directly on ice cream before.